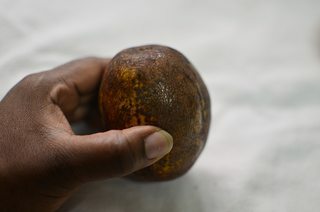 I recently bought a couple of these from a fruit seller in Sierra Leone. On the right is the stone after eating the fruit. They're small-ish, a similar size to a lime or a kiwi fruit. I asked the lady what it was called, but she just looked at me as if I was mad in stony silence (I'd already bought and paid for the fruit, despite clearly not knowing what it was, so maybe she had a point). The skin is thin but strong. 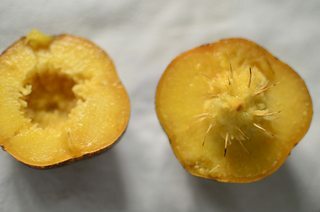 The fruit flesh had a texture and flavour similar to an unripe English plum, with maybe a hint of citrus-y melon and pear-like flavour. Quite sharp and slightly sour and/or slightly bitter, very slightly crunchy, slightly sweet (not very sweet). The flesh is very very slightly translucent and slightly whiter that the skin (you can see a little still on the stone). The spiky root-like fibres are strong, sharp and make it quite hard to eat... It's like eating a very bony fish. The only thing that came close from my research was a marula, but the stone is very different. Best guess: June Plum, apparently underripe. All the photos above are of the same type of fruit at different stages of ripeness. Spondias dulcis (syn. Spondias cytherea), known commonly as ambarella, is an equatorial or tropical tree, with edible fruit containing a fibrous pit. 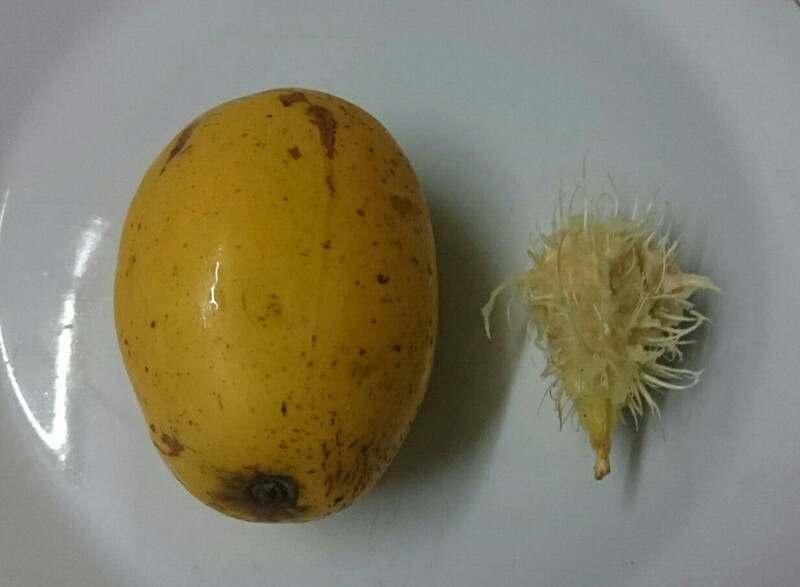 It is known by many other names in various regions, including kedondong in Indonesia, buah long long among the Chinese population in Singapore, pomme cythere in Trinidad and Tobago,1 Dominica, Guadeloupe, and Martinique,2 June plum in Bermuda and Jamaica,1 mangotín in Panama, juplon in Costa Rica, golden apple in Barbados and Guyana, golden plum in Belize, jobo indio in Venezuela, cajá-manga and cajarana in Brazil and São Tomé and Príncipe, quả cóc in Vietnam, manzana de oro in Dominican Republic, cas mango in Cameroon. In Republic of Maldives Anbulha. Spondias dulcis is most commonly used as a food source. In West Java, its young leaves are used as seasoning for pepes. In Costa Rica, the more mature leaves are also eaten as a salad green though they are tart. However, it is most commonly used for its fruit. The fruit may be eaten raw; the flesh is crunchy and a little sour. According to Boning (2006): "The fruit is best when fully colored, but still somewhat crunchy. At this stage, it has a pineapple-mango flavor. The flesh is golden in color, very juicy, vaguely sweet, but with a hint of tart acidity. "5 In Indonesia and Malaysia, it is eaten with shrimp paste, a thick, black, salty-sweet sauce called hayko in the Southern Min dialect of Chinese. It is an ingredient in rujak in Indonesia and rojak in Malaysia. The juice is called kedondong in Indonesia, amra in Malaysia, and balonglong in Singapore. The fruit is made into preserves and flavorings for sauces, soups, and stews. In Fiji it is made into jam. In Samoa and Tonga it is used to make otai. In Sri Lanka the fruit is soaked in vinegar with chili and other spices to make the snack food acharu. 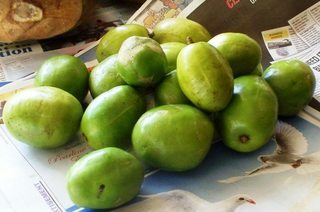 In Vietnam the unripe fruit is eaten with salt, sugar, and chili, or with shrimp paste. Children eat the fruit macerated in artificially sweetened licorice extract. In Jamaica, it is mostly considered a novelty, especially by children. It can be eaten with salt or made into a drink sweetened with sugar and spiced with ginger. In Trinidad and Tobago, it is curried, sweetened, salted, or flavored with pepper sauce and spices. In Cambodia it is made into a salad called nhoum mkak. In Suriname, the fruit is dried and made into a spicy chutney, mixed with garlic and peppers. In Thai cuisine both the fruits and the tender leaves are eaten. I am from Sierra Leone and this is called Chook-Chook Plum. Thorns & prickly things are termed chook-chook in Krio, hence the name. However, June Plum is what you will find on the internet. Not the answer you're looking for? Browse other questions tagged fruit food-identification or ask your own question.